- Mikel Landa (Team Sky) won the 2017 Vuelta a Burgos. - The 2018 Vuelta a Burgos will be held August 7-11. - Welcome to our live coverage guide for the 2018 Vuelta a Burgos (Tour of Burgos). - Official text/photos updates LIVE here. - Race leader Mikel Landa (Team Sky) won Stage 3. - News: Trentin victorious in Belorado. (Cyclingnews) - Quick-Step Floors rider beats Blythe in sprint finish. - Matteo Trentin (Quick-Step Floors) won Stage 2. Mikel Landa (Team Sky) remains overall leader. - News: Mikel Landa wins Vuelta a Burgos opener. (Cyclingnews) - Basque triumphs at Alto del Castillo. - Mikel Landa (Team Sky) won Stage 1 and is first overall leader. - 2017 Start List here. - Evgeny Kobernyak (Gazprom-RusVelo) is competing in his first race at the pro ranks: "Anxious? Yes, a little bit, but in order to improve you need to compete with contenders that are stronger than you. That’s why I look forward to experiencing the true professional level of cycling races, to test myself and learn something from my teammates. It is a significant moment for me, I am thankful for the given chance and will definitely do everything that I can for the team’s success." - Alberto Contador (Tinkoff) won the 2016 Vuelta a Burgos. - The 2017 Vuelta a Burgos will be held August 1-5. *Worldwide feeds are expected to start at 3:30pm local. - Stage 5 map, profile and info in table below. - Sergio Pardilla (Caja Rural-Seguros RGA) won Stage 5 ahead of Alberto Contador. Alberto Contador (Tinkoff) wins the 2016 Vuelta a Burgos. - Saturday's Vuelta a Burgos Stage 5 departs Caleruega at 12:14pm CET (6:14am U.S. Eastern) and is expected at the finish at Lagunas de Neila at around 4:29pm CET (10:29am U.S. Eastern). Vuelta a Burgos live streaming video should get underway at around 2:45pm CET (8:45am U.S. Eastern). - Nathan Haas (Dimension Data) won Stage 4. Gianni Meersman (Etixx-Quickstep) is new leader in the general classification. - Friday's Vuelta a Burgos Stage 4 departs Aranda de Duero at 1:04pm CET (7:04am U.S. Eastern) and is expected at the finish at Lerma at around 4:29pm CET (10:29am U.S. Eastern). Vuelta a Burgos live streaming video should get underway at around 2:45pm CET (8:45am U.S. Eastern). - Danny Van Poppel (Team Sky) won Stage 3. Dmitriy Gruzdev (Astana) remains overall leader. - Thursday's Vuelta a Burgos Stage 3 departs Sedano at 11:34am CET (5:34am U.S. Eastern) and is expected at the finish at Villarcayo at around 4:30pm CET (10:30am U.S. Eastern). Vuelta a Burgos live streaming video should get underway at around 2:45pm CET (8:45am U.S. Eastern). - Astana Pro Team won the Stage 2 TTT, placing Dmitriy Gruzdev into the leader jersey. - Wednesday's Vuelta a Burgos Stage 2, a 10.72 km Team Time Trial at Burgos, gets underway at 2:57pm CET (8:57am U.S. Eastern) with the departure of the first team. Vuelta a Burgos live streaming video should get underway at around 2:45pm CET (8:45am U.S. Eastern). - Danny Van Poppel (Team Sky) won Stage 1 and is first leader in the general classification. - Tour of Burgos Start List here. - Tuesday's Vuelta a Burgos Stage 1 departs Sasamon at 12:45pm CET (6:45am U.S. Eastern) and is expected at the finish at Melgar de Fernamental at around 4:29pm CET (10:29am U.S. Eastern). Vuelta a Burgos live streaming video should get underway at around 2:45pm CET (8:45am U.S. Eastern). - The 2016 Vuelta a Burgos will be held August 2-6. - Saturday's Vuelta a Burgos Stage 5 departs Comarca Pinares (Comunero de Revenga) at 11:47am CET (5:47am U.S. Eastern) and is expected at the finish at Lagunas de Neila at around 4:13pm CET (10:13am U.S. Eastern). Vuelta a Burgos live streaming video should get underway at around 3:00pm CET (9:00am U.S. Eastern). - Friday's Vuelta a Burgos Stage 4 departs Belorado at 12:26pm CET (6:26am U.S. Eastern) and is expected at the finish at Pineda de la Sierra (Valle del Sol) at around 4:15pm CET (10:15am U.S. Eastern). Vuelta a Burgos live streaming video should get underway at around 3:00pm CET (9:00am U.S. Eastern). - Thursday's Vuelta a Burgos Stage 3 departs Castrojeriz at 12:20pm CET (6:20am U.S. Eastern) and is expected at the finish at Villadiego at around 4:15pm CET (10:15am U.S. Eastern). Vuelta a Burgos live streaming video should get underway at around 3:00pm CET (9:00am U.S. Eastern). - Stage 2 Team Time Trial Start Order and Times here. - Astana won the Stage 2 TTT. Luis Leon Sanchez (Astana) is new leader in the general classification. - Wednesday's Vuelta a Burgos Stage 2, a 13.14 km Team Time Trial at Burgos, gets underway at 3:15pm CET (9:15am U.S. Eastern) with the departure of the first team. Vuelta a Burgos live streaming video should get underway at around 3:00pm CET (9:00am U.S. Eastern). - Carlos Barbero (CJR) won Stage 1 and is first race leader. - Tuesday's Vuelta a Burgos Stage 1 departs Santo Domingo de Silos at 12:41pm CET (6:41am U.S. Eastern) and is expected at the finish at Ciudad Romana de Clunia at around 4:13pm CET (10:13am U.S. Eastern). Vuelta a Burgos live streaming video should get underway at around 3:00pm CET (9:00am U.S. Eastern). - Nairo Quintana (Movistar) won the 2014 Vuelta a Burgos but is not back to defend. - The 2015 Vuelta a Burgos is being held August 4-8. - Nairo Quintana (Movistar) won the 2014 Vuelta a Burgos, successfully defending his 2013 title. - Stage 5 TT Start Order and Times here. - Sunday's Vuelta a Burgos Stage 5, a 12.45 km Individual Time Trial at Aranda de Duero, gets underway at 12:44pm CET (6:44am U.S. Eastern) with the departure of the first rider. Vuelta a Burgos live streaming video should get underway at around 1:15pm CET (7:15am U.S. Eastern). - Lloyd Mondory (AG2R) won Stage 4 as Daniel Moreno grabbed the overall race lead from Nairo Quintana. Moreno and Quintana have the same overall time going into Sunday's final stage TT. - Saturday's Vuelta a Burgos Stage 4 departs Medina de Pomar at 11:21am CET (5:21am U.S. Eastern) and is expected at the finish at Villarcayo at around 2:43pm CET (8:43am U.S. Eastern). Vuelta a Burgos live streaming video should get underway at around 1:15pm CET (7:15am U.S. Eastern). - Friday's Vuelta a Burgos Stage 3 departs Comarca Pinares (Comunero de Revenga) at 11:47am CET (5:47am U.S. Eastern) and is expected at the finish at Lagunas de Neila at around 4:13pm CET (10:13am U.S. Eastern). Vuelta a Burgos live streaming video should get underway at around 2:45pm CET (8:45am U.S. Eastern). - Thursday's Vuelta a Burgos Stage 2 departs Briviesca at 12:39pm CET (6:39am U.S. Eastern) and is expected at the finish at Villadiego at around 4:15pm CET (10:15am U.S. Eastern). Vuelta a Burgos live streaming video should get underway at around 2:45pm CET (8:45am U.S. Eastern). - Nairo Quintana will be racing for the first time since winning the Giro d'Italia as he prepares for the Vuelta a Espana. More here. - D.S. Lionel Marie of Giant-Shimano on the Vuelta a Burgos: "Burgos will be a good race for those who are riding the Vuelta a Espana to fine tune their form." The team brings the following riders to the race: Lawson Craddock, Thomas Damuseau, Chad Haga, Koen De Kort, Steven Lammertink, Sea Keong Loh, Daan Olivier, and Tom Peterson. - Nairo Quintana (Movistar) won the 2013 edition and is back to defend. 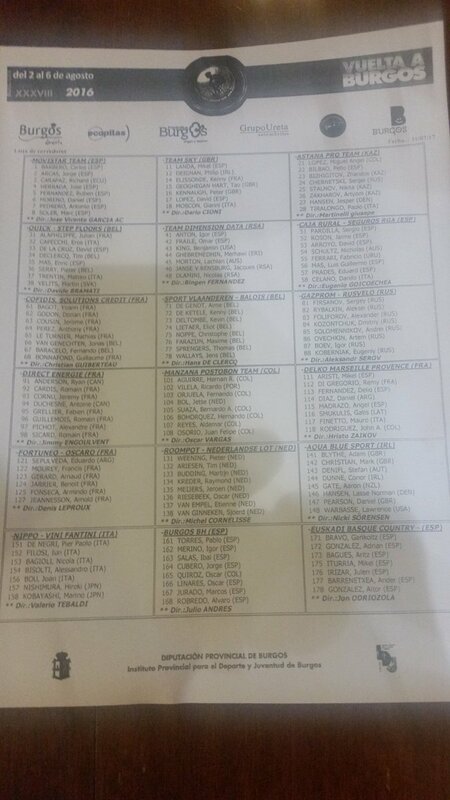 Other riders expected on the start line include: Betancur, Nocentini, Brajkovic, Visconti,... Full start list here. - Wednesday's Vuelta a Burgos Stage 1 departs Burgos at 12:42pm CET (6:42am U.S. Eastern) and is expected at the finish at Burgos/El Castillo at around 4:15pm CET (10:15am U.S. Eastern). Vuelta a Burgos live streaming video should get underway at around 2:45pm CET (8:45am U.S. Eastern). - Nairo Quintana (Movistar) won the 2013 Vuelta a Burgos. - Sunday's Vuelta a Burgos Stage 5 departs Comunero de Revenga at 1:02pm CET (7:02am U.S. Eastern) and is expected at the finish at Lagunas de Neila at around 5:30pm CET (11:30am U.S. Eastern). Vuelta a Burgos live streaming video should get underway at around 3:30pm CET (9:30am U.S. Eastern). - Saturday's Vuelta a Burgos Stage 4 departs Dona Santos at 12:48pm CET (6:48am U.S. Eastern) and is expected at the finish at Santo Domingo de Silos at around 4:51pm CET (10:51am U.S. Eastern). Vuelta a Burgos live streaming video should get underway at around 3:30pm CET (9:30am U.S. Eastern). - Friday's Vuelta a Burgos Stage 3 departs Villadiego at 12:45pm CET (6:45am U.S. Eastern) and is expected at the finish at Ojo Guarena at around 5:00pm CET (11:00am U.S. Eastern). Vuelta a Burgos live streaming video should get underway at around 3:30pm CET (9:30am U.S. Eastern). - Thursday's Vuelta a Burgos Stage 2 departs Roa de Duero at 1:18pm CET (7:18am U.S. Eastern) and is expected at the finish at Ciudad Romana de Clunia at around 5:00pm CET (11:00am U.S. Eastern). Vuelta a Burgos live streaming video should get underway at around 3:30pm CET (9:30am U.S. Eastern). - Wednesday's Vuelta a Burgos Stage 1 departs Burgos at 1:43pm CET (7:43am U.S. Eastern) and is expected at the finish at Burgos/El Castillo at around 5:00pm CET (11:00am U.S. Eastern). Vuelta a Burgos live streaming video should get underway at around 3:30pm CET (9:30am U.S. Eastern).